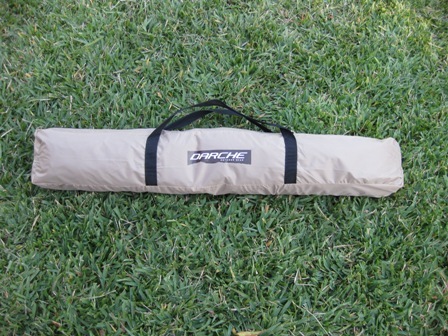 I recently purchased a Darche Outdoor Gear camp shelter from Swags & Camping Direct. Price was $129 delivered. On receiving the camp shelter, I was surprised at how small the package was. I measured it at approximately 82 cm x 8 cm x 11 cm and the packaging says that it weighs 3.5 kg. 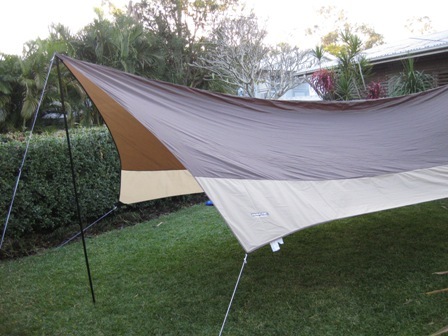 The shelter cover is very light – similar to the outside skin of your average nylon dome tent. The light weight means that it does not take much to hold it up. Notably, at 6.4 m x 4.4 m the shelter area is significantly larger than other hiking-style flys I have seen. 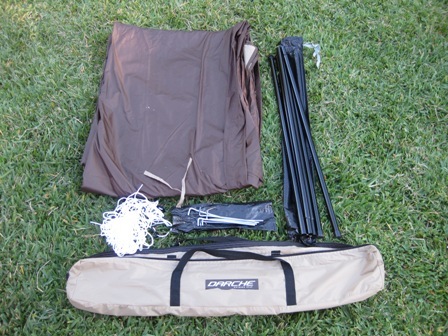 The camp shelter kit comes with six pegs and ropes. The Darche pictures only show guy ropes on three corners of the shelter. I was intrigued how the poles were being held up, but obviously a little Photoshop work has removed the additional two ropes in the photo (and the one behind the shelter for that matter). The two ropes for the poles are longer than those for the four corners and all come with nylon sliders to adjust the guy rope lengths. The steel pegs are only 16.7 cm long, but are probably adequate given the light weight shelter – just keep an eye on them in strong wind because the shelter could make a very effective kite! The first time I set up the Darche camp shelter, I laid the cover out on the ground at home and attached the guy ropes with Lark’s head knots (which I intend leaving in place for future set-ups). I then hammered in the pegs (being careful that my water-divining tent pegs missed the water main running across my front lawn to my house!) and erected the poles. The camp shelter went up easily and quickly. The camp shelter was nearly too big to fit on my front lawn, so I did not have enough room to properly position the guy ropes. I think with some more room and careful set up, I should be able to pull out most of the bow in the ridge line. After reviewing the above photo, I think that there will be two key factors in pulling out the bow in the ridge: 1) set the pole guy ropes out wide to allow plenty of leverage to tension the ridge (I did not have room on my front lawn); and, 2) set the corner guy ropes almost perpendicular to the ridge line which will result in tension across the poles rather than across the centre of the shelter (as above, pulling down the middle of the shelter). I may consider running a 4 mm rope between the poles as the ridge line — that way I can tension up the ridge to remove most of the bow without the risk of tearing the shelter cover. The poles are the right height for my purpose, but I may consider putting some aluminium sliders that I have sitting around on the guy ropes. I will also probably use heavier pegs – I have plenty spare in my camping kit. The final thing I might consider is adding some lightweight springs to the ends of the guy ropes to allow some give in the set-up when it is hit by wind gusts. All easy tweaks that may turn out to not be necessary.